When young children have a seizure (also called a convulsion), it is often caused by a fever above 102°F (38.9°C). 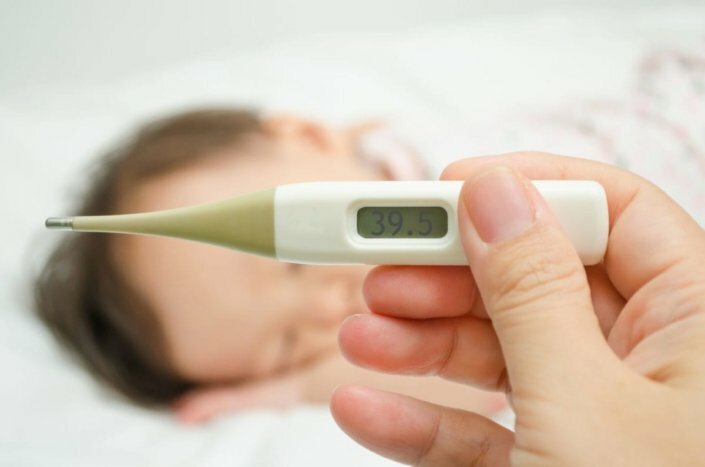 These are called “fever seizures” or “febrile seizures.” Febrile seizures can occur in children ages 6 months to 5 years, but are most common in toddlers ages 12 months to 18 months. Febrile seizures are frightening, but they aren’t as dangerous as they may appear. How serious are febrile seizures? Generally, febrile seizures aren’t harmful to a child. A febrile seizure doesn’t cause brain damage. Also, your child can’t swallow his or her tongue during a seizure. (It is physically impossible for someone to swallow his or her tongue.) Febrile seizures usually last a few minutes. It’s very unusual for a febrile seizure to last more than 5 minutes. Usually, a child who has had a febrile seizure does not need to be hospitalized and probably does not need X-rays or a brain wave test. Your child may only need to be seen by your family doctor so the cause of the fever can be found. If your child has a febrile seizure, he or she may become unconscious and roll his or her eyes back. Your child’s arms and legs may become stiff or shake and twitch. Your child may also vomit. After a seizure, your child may feel drowsy and confused. Febrile seizures are triggered by fever, but infection is what causes fever. Your child is more likely to spike a high fever from a viral infection than a bacterial infection. Examples of viral infections are the flu, common cold, and roseola. If my child has a febrile seizure, does this mean that he or she has epilepsy? No. A single seizure does not mean your child has epilepsy. Even repeated febrile seizures aren’t considered epilepsy, because children outgrow the risk of having a seizure caused by fever. A child who has epilepsy usually has 2 or more seizures that aren’t caused by fever. Febrile seizures don’t cause epilepsy. But the chance of epilepsy developing in a child who has had several febrile seizures is slightly higher than if he or she didn’t have a febrile seizure. That chance is about 2% to 4%. There is no evidence that treating your child with medicine for febrile seizures will prevent epilepsy. You should see your doctor as soon as possible after a febrile seizure. Your doctor will examine your child and ask you questions about the seizure. Your doctor also may order tests to determine what is causing your child’s fever. Can febrile seizures be prevented or avoided? Maybe, but many doctors believe the risk of side effects from seizure medicines are worse than your child having another febrile seizure. Even if medicine is used, it may not prevent another seizure. What should I do if my child has a seizure? Put your child on his or her side so that he or she won’t choke on saliva or vomit. Don’t put anything in your child’s mouth. Don’t restrain your child’s movements during the seizure. Try to remain calm. Most seizures stop on their own within a few minutes, so keep your eyes on a clock or watch. Call 911 if the seizure lasts more than 10 minutes or is accompanied by a stiff neck, vomiting, or breathing problems. Don’t try to lower your child’s fever by placing him or her in a cold bath, especially during a seizure. What should I do after the seizure has stopped? Call your doctor. He or she may want to see your child to find a cause for the fever. Your child is younger than 18 months. There’s a family history of febrile seizures. The fever wasn’t very high when the seizure occurred. What caused my child’s febrile seizure? Will my child have another febrile seizure? Is there anything I can do to prevent a febrile seizure? Are there signs that I should look for before my child has a febrile seizure? Should I hold my child while he or she has a febrile seizure? Should I put a tongue depressor in his or her mouth during the seizure? Is there anything I can do after a seizure to make my child more comfortable? Should I have my child checked for epilepsy if he or she has a seizure?